In a recent past post, I wrote about my new favorite style inspiration–Seventies Prep and several friends asked me what the heck that was and how I was going to interpret it. It started when I came across this yummy polyester vintage shirt with the most divine red print. I wore it under a t-shirt and jeans and felt so very much at home and rather spiffy. Really, I just love a good print. And the seventies had many good prints. Not the wild disco ones that people think of with the seventies. But the more subdued look of the seventies through the subtle Prep lens. It’s not about hit you over the head pink and green polos with headbands kind of prep. Or the gold lame disco interpretation of the seventies. But the smoother subtle conservative prep with the funk of the seventies added for charm. 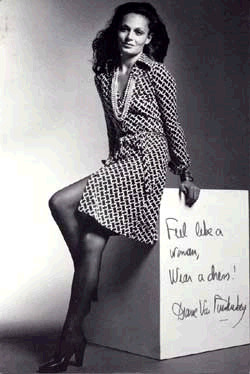 And definitely some DVF. Rock that wrap dress baby! Some nice bamboo print. Sort of between the clean scandinavian lines with antiques sort of look for design and oh so very cozy and comforting to me. But that layered on top of my already vintage look. 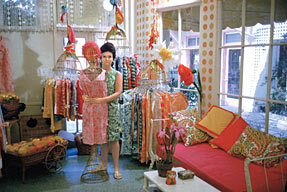 I think I might have to go shopping with one of my favorite fashion muses. the lovely Galaxy Girl at Strawberry Lemonade. Have you seen her blog? If not, I highly recommend a drop by. So I guess I should be looking for matching Vespas then? I’ll start right away. Previous Previous post: I heart bargello!